It's no secret at all that I'm well and truly addicted to pinterest, and a while ago I saw an idea I loooved! 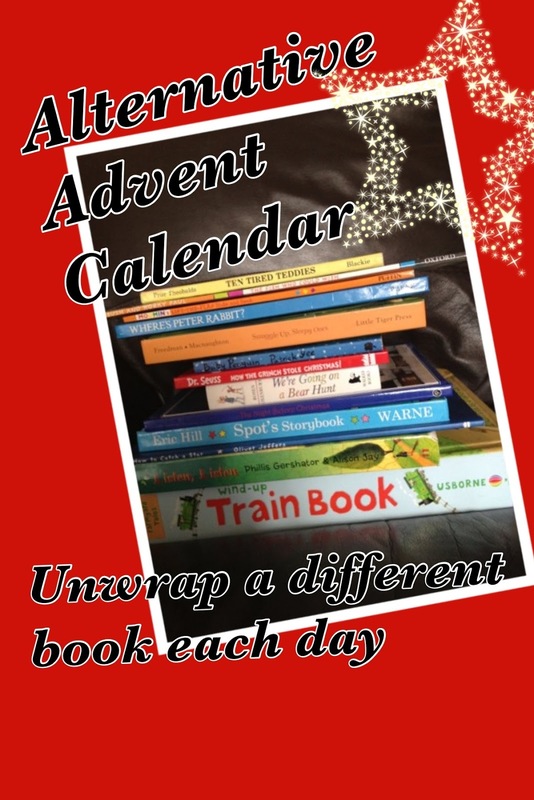 Someone had the ingenious idea of instead of having an advent calendar, you have a different book to unwrap and read each day. Now, I love books and you've probably noticed a few of my blog posts have been book reviews, or about children's books and reading in general so naturally this idea sounded fab to me! I showed it to hubby and he loved it too and I eagerly set about trying to see how I could do it .... You see, there's the minor issue of money - isn't it always about money! At an average of £7 a book times 24 books I'd be looking at about £170 for my "advent calendar" so not very realistic, I also looked at eBay or charity shops but even second hand at bargain prices, I'm still looking at a large sum of money and then also not necessarily the books on my hit list! So, what books are on my list of 24 alternative advent calendar books? These are not in any particular order by the way. 1. The Pajama Elves - Hayden Edwards. 2. The Tiger who came to tea - Judith Kerr. 3. Owl Babies - Martin Waddell. 4. Belle and boo and the birthday surprise - Mandy Sutcliffe. 5. If I were an elephant - Anne wilkinson. 7. Operation Alphabet (the ministry of letters) Al MacCuish. 8. This Moose Belongs To Me - Oliver Jeffers. 9. A Bit Lost - Chris Haughton. 10. The Heart and the Bottle - Oliver Jeffers. 11. Meg and Mog - Helen Nicoll. 12. Monkey and Robot, Cardboard Robot - Felix Hayes. 13. My First Gruffalo Touch and Feel - Julia Donaldson. 14. The Great Paper Caper - Oliver Jeffers. 15. Oh No, George! - Chris Haughton. 16. The Incredible Book Eating Boy (Pop up edition) - Oliver Jeffers. 18. The Adventures of Mrs Pepperpot - Alf Proysen. 19. Peepo - Allan Ahlberg. 20. Illustrated Stories from Dickens - Charles Dickens. 22. The Lorax - Dr Seuss. 23. I Want My Hat Back - Jon Klassen. 24. Otto the Book Bear - Katie Cleminson. My personal books of the moment? Has to be the Pop Up version of Lost and Found by Oliver Jeffers - we just love that book, I bought it for my son's birthday and we read it over and over again - it has the most amazing paper engineering I've ever seen. Or the usbourne wind up books - we have the train one - it's a big thick book which has stories and on 3 of the pages are train tracks with a wind up train to run along! I like the look of the leapfrog tag reading system for Blake and also the new leap pad explorer 2 for stories. I'd quite like to see how he got on with them - there's a new tag junior for ages 2-4 as well as the tag system for ages 4-8 to help learn independent reading and discovery - the solar system adventure map looks amazing! Love this book idea. I may do it next year!